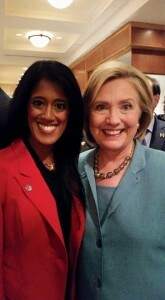 Twins Cities resident Shivanthi Sathanandan, with Hilary Clinton during a 2015 visit to Minneapolis. Sathanandan was named to the Hilary for American AAPI Leadership Council on Wednesday. NEW YORK (Jan. 13, 2016) — Hillary for America announced the launch of its Asian Americans and Pacific Islanders for Hillary Leadership Council – a group of over 150 elected officials, community, and grassroots leaders who will help build a grassroots-driven volunteer team that will help Hillary Clinton engage, energize and organize support in the AAPI community ahead of the caucuses and primaries. Leadership Council members share Clinton’s commitment to raising wages for the middle class, strengthening our nation’s infrastructure to create good-paying jobs, defending and enhancing the Affordable Care Act, ensuring that cost is not a barrier for students going to college, reforming our broken immigration system and much more. You can learn more about Clinton’s agenda at https:/www.hillaryclinton.com/issues/. · The Honorable Chris Lu, Washington, D.C.
· Community Leader Irene Bueno, Washington, D.C.
· Community Leader Gregory Cendana, Washington, D.C.
· Community Leader Yee Chang, Washington, D.C.
· Community Leader Anna Chu, Washington, D.C.
· Community Leader Ankit Desai, Washington, D.C.
· Community Leader Vincent Eng, Washington, D.C.
· Community Leader Mieke Eoyang, Washington, D.C.
· Community Leader Irene Hirano Inouye, Washington, D.C.
· Community Leader Frank Islam, Washington, D.C.
· Community Leader Krystal Ka’ai, Washington, D.C.
· Community Leader Channapha Khamvongsa, Washington, D.C.
· Community Leader Dave Kumar, Washington, D.C.
· Community Leader Sunita Leeds, Washington, D.C.
· Community Leader Nicholas Lepham, Washington, D.C.
· Community Leader Timothy Lim, Washington, D.C.
· Community Leader Parag Mehta, Washington, D.C.
· Community Leader Madalene Mielke, Washington, D.C.
· Community Leader Mona G. Mohib, Washington, D.C.
· Community Leader Loren Nadres, Washington, D.C.
· Community Leader Irene Natividad, Washington, D.C.
· Community Leader Amanda Nguyen, Washington, D.C.
· Community Leader Erin Oshiro, Washington, D.C.
· Community Leader Carrie Pugh, Washington, D.C.
· Community Leader Gautam Raghavan, Washington, D.C.
· Community Leader Linda Shim, Washington, D.C.
· Community Leader Laura Shin, Washington, D.C.
· Community Leader Arshi Siddiqui, Washington, D.C.
· Community Leader Naomi Tacuyan Underwood, Washington, D.C.
· Major General Tony Taguba (Retired), Washington, D.C.
· Community Leader Alvina Yeh, Washington, D.C.
AAPRESS.COM misidentified Shivanthi Sathanandan as an attorney in the caption for our archived photo that was posted with the Clinton campaign press release. Sathanandan is not an attorney and the caption was changed at her request. We regret this error.